Global Water Dances is a world event first launched in June 2011. The second global performance occured June 15, 2013. Our next day of dance to protect the earth’s waters is June 20, 2015. On a single day, a series of dances centered on water issues are performed beginning in the Western Pacific Rim, then encircling the planet. These dances are also livestreamed for 24 hours around the globe. Where will you be? Will you join us? Global Water Dances uses free outdoor dance and music performances to blend local water issues with the global struggle to ensure safe water for all human beings. (Read about our musicians) Global Water Dances will start with performances in countries in the Pacific Rim, rolling westward through the time zones. Each group will produce a 4-part site-specific performance; the first two parts local and latter two global. Dr. Martha Eddy has lead http://globalwaterdancesny.org/ Will participate in NYC Global Water Dances this year. We hope you will check out the website and find a location near you! In Pakistan, we are developing a mentoring/coaching program as well as a Learning and Training Center. I’m working directly with the woman who is in charge of the Local Support Organization – a graduate from the University of Karachi – who introduces herself as “a radical feminist”. My work with her at this point is via e-mail and phone via our local Pakistani staff since there are many impediments for me to get back to Pakistan at this time. We were together over the summer and the work of the community is focused on basic issues of women’s empowerment – home financing, self-awareness and encouraging entrepreneurial enterprise. Body-related issues are particularly related to health and hygiene – but not only. There are traditional skin products the older women use and you can see a glow in their faces that lack in the younger women, who have been soaped and store-bought creamed out. The older women are filled with stories of traditional medicinal remedies and beauty traditions – but do not see themselves as a resource because of their illiteracy, and thus, their sense of self-deprecation. But that said, there is no running water in this Valley of 4000 meters! So the cold does not make cleanliness via water very conducive during the freezing winter. Girls in the Chipursan Valley are better off than most – but this is due to the overriding impact of the Aga Khan and the homogeneity of the Ismaeli community, which is conducive for social change in the direction of enhanced well being. So many of us know adults and children who really KNOW the skills of conflict resolution… AND… who forget to apply these skills in the real moment of conflict. One key aspect of my experience with expert teachers of conflict resolution was that they modeled peaceable behavior frequently. The more often we model a non-reactive creative and compassionate response to hard situations the more possibility there is for a peaceful world. In order to do this we ne need to counter the mainstream media and inundate, infiltrate, create, positive images of creating connection through conflict. MakeTalkWork is an opportunity to provide visual samples that model creative and positive responses to conflict. Since the medium for the competition is video body movement is inherently featured. I hope that if you already have video footage on your camera, computer, dvds, or tapes that you’ll consider sharing snippets that can inspire either to Make Talk Work (See Marie Volpe’s entry on the Embody Peace page March 11) or to this site. Perhaps you’ll go create a video tomorrow! MAKE TALK WORK™ bookmark tips were created by dispute resolvers in NYC and funded by the JAMS Foundation. Lets Walk (and Run, and Leap) the Talk! Looking forward to SEEING your responses! Are you a Pre-K to 12th educator or parent interested in experiential learning and the environment? Please join us on Tuesday August 12th for a laboratory day of fun explorations geared towards environmental education. 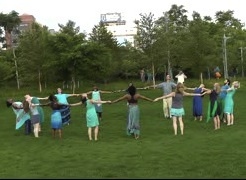 This day long workshop led by Martha Eddy, somatic educator/curriculum specialist, Jane Vorburger, biology major and dance teacher, together with environmental educators, Judy Isacoff, Daniel Roth and Paula Sager will engage participants in activities including “Sensory and somatic explorations inside and outside” and eco-walks and eco-dances. “Eco-moves for Kids” Curriculum Development workshop will give childhood educators an opportunity to discuss and explore lesson plans that would foster students’ stewardship of the earth and social development via interdisciplinary coursework that combines creative movement with traditional classroom work. We intend to share at least one series of lesson plans that offer teachers ways of nurturing childrens’ respect for their natural environments as well as respect for the diversity within their human communities. The workshop will also include informational discussion, reflective discourse, and lesson brainstorming. Teachers will have an opportunity to explore adaptations to different age groups. The project leaders from CKE will provide supportive materials such as current National (or state) Science Education Standards and sample environmental education syllabi for elementary school children. Martha Eddy, Director of Somatic Studies/Moving On Center & Center for Kinesthetic Education (www.WellnessCKE.net ), is an internationally recognized leader of somatic education who consults in schools integrating kinesthetic awareness with academic, aesthetic, health, and socio-emotional goals. Jane Vorburger danced with American Ballet Theater and currently teaches residencies in dance in NYC schools. INTERDISCIPLINARY week at EARTHDANCE. Plainfield, MA. The workshop is followed by dinner and then a panel ($10) that engages youth and educators in a moving dialogue on the intersection of themes related to conflict on our planet and embodied responses for community building and peace: Gaia Speaks: Youth Responses to a Planet in Pain at 8pm. We founded HiMaT Grassroots Development Foundation in the spring of 2007 in Pakistani Kashmir in order to coach the 40.000 villagers living at the foot of Nanga Parbat to tackle their abject poverty and build prosperous sustainable communities. “Self-drive and personal effort, create sustainable transformation”. In 2003, Frieder became fascinated by “community-led” development through a YPO resource who successfully applied similar principles to re-build Bosnian communities. A couple of years later, Frieder championed the “YPO Village Partnership Action Forum” and organized trips to Africa, India, Pakistan, the Middle East, Bosnia and Central America to learn from the most reputable practitioners in the field. These included Jeff Sachs’ Millennium Villages in Africa, the Aga Khan Rural Support Program in Africa and Asia and former ABB CEO Percy Barnevik’s highly successful job creation program Hand in Hand in India. In 2006, Deborah, a social anthropologist, joined the Village Partnership Forum to direct her passion for peace building into community-led development in conflict zones. She brings her academic and practical knowledge of conflict resolution and gender studies from her engagement in the Israeli-Palestinian struggle. Deborah makes sure that traditional cultural practices and values are well integrated into an over-all “bottom-up” plan for sustainable economic development, and that gender relations – a driving force of all culture – are gently negotiated. We help villagers form groups so they can learn from each other and gain access to credit, and we provide training, market access and start-up support. Again, we help villagers form groups to tackle their joint issues, coach them to identify and utilize their own resources and potential, introduce novel ideas and ways of thinking, and provide connections to external know-how and sources of funding. Our larger vision is to gain so much practical learning and reputation with our Kashmiri pilot project that it becomes a model for others in the world to emulate. For this purpose, we have begun to build a “Village Partner Alliance” between the worlds’ most experienced and respected organizations in community-led development to exchange our learning, formulate Best Practices, develop joint training programs and create the necessary critical mass to popularize the success of the “community-led” development approach. A key aspect of our vision is to team up socially-minded YPOers with results-oriented social entrepreneurs to rapidly spread “community-led development” in the world. 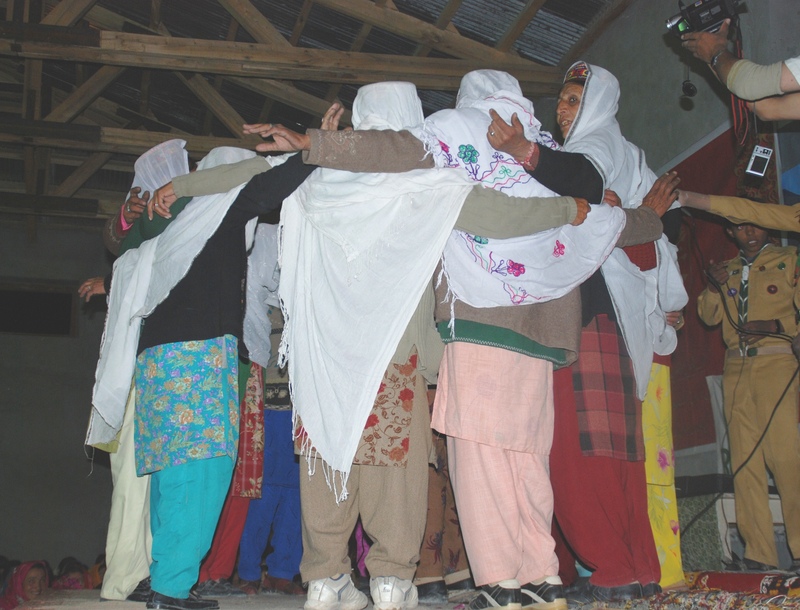 The arithmetic is simple: If 5.000 YPOers each take on communities of 40.000 people, like we do in Kashmir, and convince 10 of their business friends to do the same – then poverty will be no more….